Envision this: you’re sitting on the coach one night, surfing cheaptickets.com with your boyfriend, and find an unbelievable deal on flights to Paris. On a whim, you book a trip, with only 2 weeks to work out rest of the details. You spend most of those 2 weeks just daydreaming about being whisked around Paris, looking impossibly chic with the Eiffel tour looming in the background. You picture yourself drinking champagne and eating oysters twice daily because, well, the world is your oyster isn’t it? And then you arrive. You realize your ticket was impossibly cheap because Paris in November is blustery and gray. And your bags were lost. Instead of feeling tres chic, you’re feeling tres hobo in your grimy, rumpled clothes. But you’re determined not to let any of this get you down. You’re in Paris after all! Yes, this was me and Matt a couple of months back. Our first 24 hours in the city of lights were, uh, less than sparkly. We arrived tired, dirty, crabby, and without most of our luggage. And to make matters worse, my (brilliant) fiancé had decided to shove his coat in our checked bag (who would do that???). We found our way to our apartment and spent our first few hours of vacation napping and trying de-crabify. When we woke, I convinced Matt to take a jacket-less walk around our neighborhood to scope things out. It’ll be fine, I assured him, the wind has probably died down and once we get moving, it’ll be great. Well, not exactly. But we made the most of it and walked around, ducking into shops to warm up, peeking in gallery windows, and checking out restaurant menus. We went out for dinner and practically sleepwalked back to our place, determined to start fresh the next day. By the next afternoon, our luggage had arrived, we’d had a decent night’s sleep, and our not-so-great first day of the trip was a distant memory, except for this one image that kept popping into my head: I kept picturing a cozy creperie we had passed by on our walk. I remembered peering through steamed up windows into a tiny dining room with wood paneling. 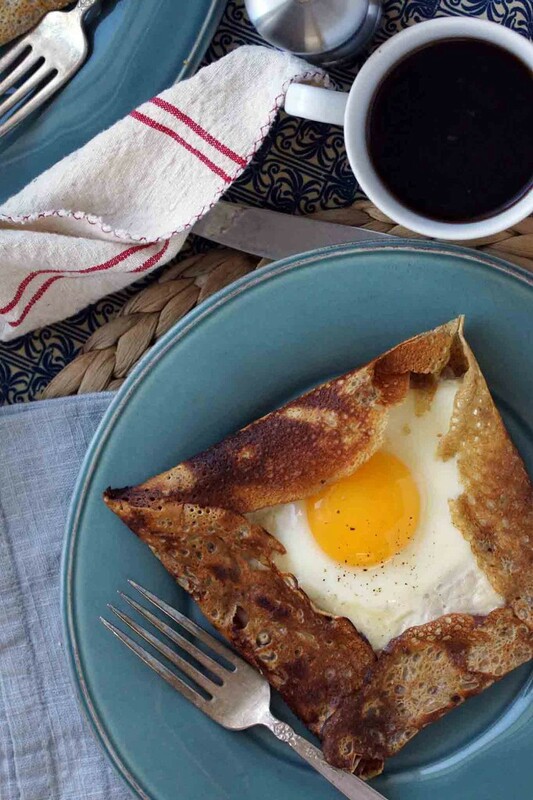 Everyone inside was eating these gorgeous savory crepes with sunny-side-up eggs. They were smiling and looked so warm, so happy. I had wanted to be in there so badly with all of them instead of outside, freezing my derrière off. Over the next few days, every time a blast of wind cut through me, I’d imagine that restaurant. I knew it must be very close to where we were staying, but somehow we had not passed it again. I began to think it had been a hallucination, something my jet-lagged brain had cooked up to try to warm me that first day. Finally, towards the end of our stay, we found our way back to this creperie and I realized it did indeed exist outside my head. We walked in, late afternoon, out of the chilly Paris drizzle and each had our very own galette complète. Thankfully, they were as delicious in reality as they had been in my imagination. 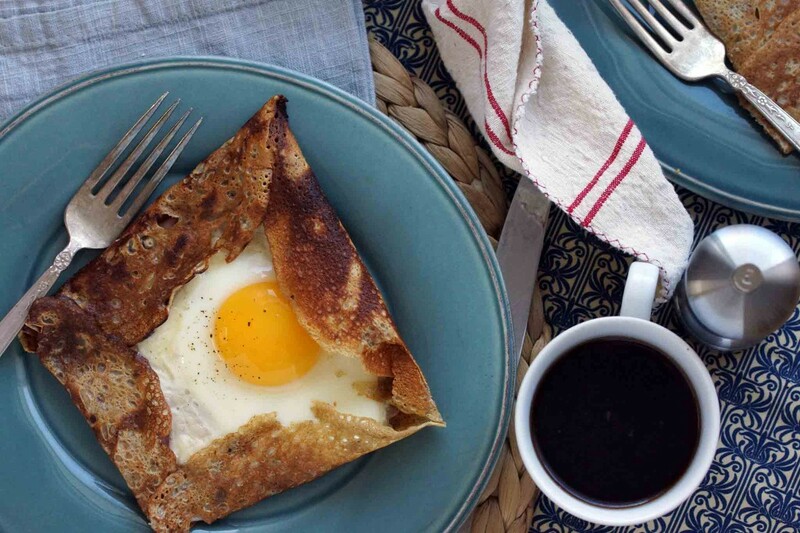 A galette (at least in this context) is a buckwheat crepe with a savory filling. Most of the galettes on this cafe’s menu were filled with ham, cheese, and maybe a few veggies, completed with a sunny-side-up egg. The fillings are loaded into the center of the crepe, then the edges are folded to create a square envelope, framing a brilliantly orange yolk. We had ours with hard cider served out of tiny ceramic bowls and I knew this would be a treat I’d be trying to recreate as soon as we got home. 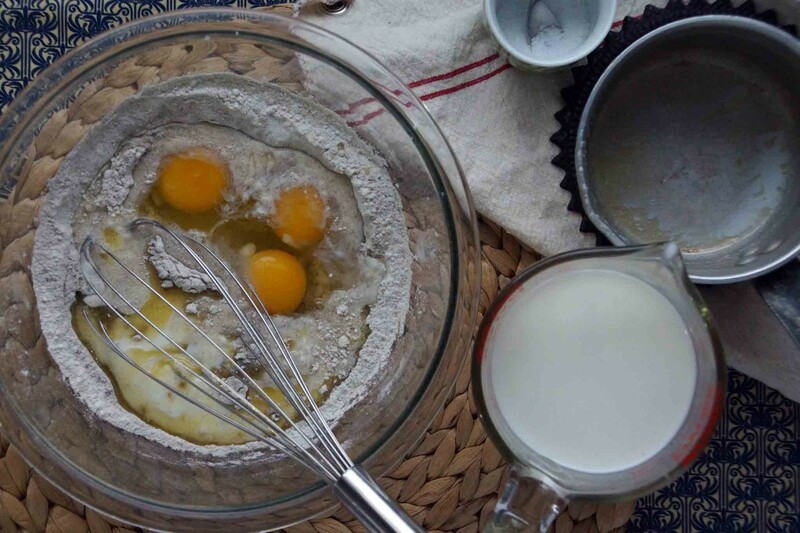 For the crepe batter, I looked to David Lebovitz. It seemed appropriate, after I discovered he has written about the same creperie on his website. Just whisk together all-purpose and buckwheat flours, a little sugar, a little salt, milk, and melted butter until you have a smooth batter. Let it chill for a few hours or overnight. When you’re ready to start frying off the crepes, give the batter a good stir. The flour tends to settle, making the contents of the bottom of the bowl feel like glue while the top is the consistency of straight-up milk. Stir it until it finds common ground and is the consistency of heavy cream. Heat a crepe pan or non-stick skillet and start making crepes. Quickly swirl the batter around the pan, in a thin, even layer. It will tell you when it’s ready to be flipped, as it won’t budge a moment before it’s ready. And don’t worry–the first crepe (or 2) is always a flop. Now that you have a stack of buckwheat crepes, you’re ready to turn them into a galette complète. Grab some sliced ham, grated cheese, and eggs and head back to the stove. Heat the crepe, ugly-side down for a few seconds, then flip. Place a piece of ham in the center, crack an egg in the middle, and sprinkle a little cheese over the top. 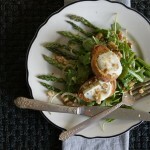 As the cheese starts to melt, fold the edges up to frame that beautiful yellow-orange yolk. Cook until the egg white sets and the yolk is still quite runny. You can get a couple of frying pans going or pop a few on a baking sheet in the oven, if you’re cooking for more than just yourself. Mine aren’t as beautiful or quite as finessed as the ones we had in Paris, but it doesn’t matter; they are my new favorite “breakfast for dinner” or leisurely weekend brunch anyway. Feel free to add a few sautéed mushrooms or caramelized onions to the galettes. In a large mixing bowl, whisk together all of the ingredients for the buckwheat crepes. Cover and chill for a few hours or overnight. Let the batter sit at room temperature for an hour before you begin frying off the crepes. Give it a good stir, as the batter will have settled while it was chilling. It should be the consistency of heavy cream; if it seems too thick, whisk in a splash of milk to get it to the right consistency. Heat a crepe pan or non-stick skillet over medium-high heat. Add a little butter and wipe it around the pan. Lift the pan, pour about ¼ c. of the batter into the center and quickly swirl it around to coat the bottom. It will likely take you a crepe or 2 to get the temperature of the pan just right. Cook the crepe for 30 seconds-1 minute until it releases easily from the pan (it’ll let you know when it’s ready—don’t try to force it! 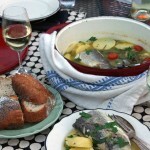 ), then flip and cook on the other side for 30 seconds. Transfer to a plate and repeat until you’ve used all the crepe batter. I like to make the whole batch, even if I’m only eating/serving a couple, and keep the rest stacked and wrapped in the refrigerator for quick meals later in the week. 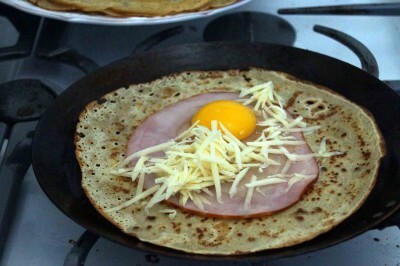 To make a galette, heat the crepe pan and wipe a tiny bit of butter around the bottom. Add the crepe, ugly-side down (you’ll know which side I’m talking about), heat for 10 seconds or so, then flip. 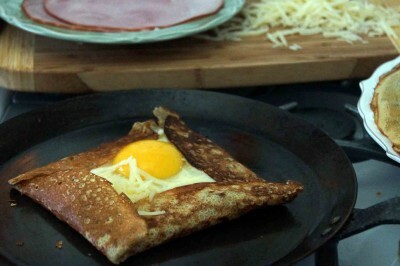 Place a slice of ham in the center of the crepe and then crack an egg on top of the ham. Sprinkle about a ¼ c. of grated cheese around the egg and cook over medium heat until the egg white sets. 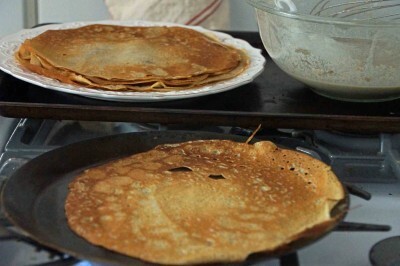 If you want to speed up the process, put a domed lid or another frying pan over the crepe. 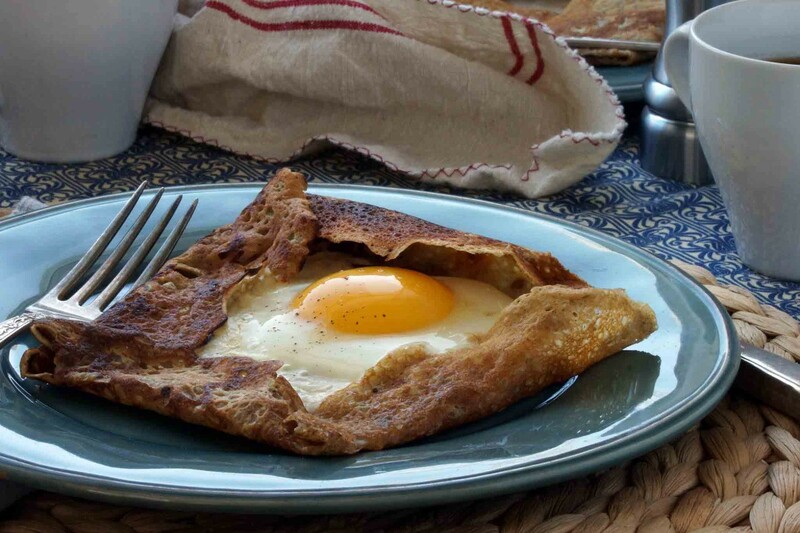 As soon as the cheese has melted, fold the edges of the crepe up so the galette is square and the yolk is framed by the round edges of the crepe. 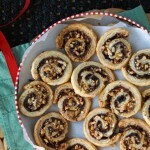 If you’d like to make more than 1 or 2 at a time, you can make them in the oven, as well. Just assemble as many as you’d like on a baking sheet(s) and pop them in a 350° oven until the egg whites set, about 10 minutes. 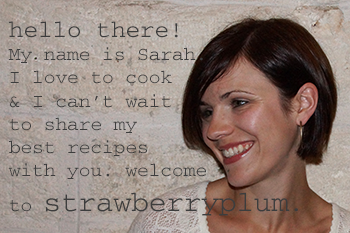 Plus, stay tuned…I’m (slowly!) working on getting photos together from the trips I’ve taken in the past few years to share on my site. Watch for a “Travel” page to appear very soon. This makes me wish that I liked sunny-side up eggs! I know Dad would enjoy the buckwheat! Pictures are gorgeous! Keep daydreaming through this cold winter! You just think you don’t like sunny-side up eggs. Geez…I sound like the mother in this situation! Btw, this made me think of poppy and his egg and pancake sandwiches…maybe he was half French and we never knew it!